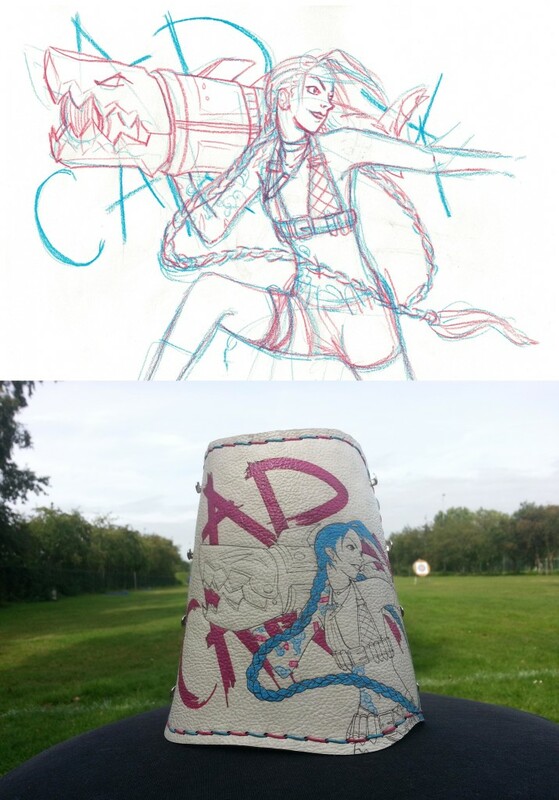 From sketches to finished product – how much more custom can it get? So, you have an idea about what you want but not a definite design. Maybe you want something blue. Or something looking ‘winter-y’. Or you really like the style they used in a movie. Now what? As an illustrator I get a lot of personal requests for custom designs. These designs vary from difficult figures to geometrical shapes and colors. There are so many more possibilities than most people can imagine! Some people deliver me photo’s of cool tattoos, personal items, even pets that they would like to see integrated into a new design. That is of course always a very steady start. Others create their own moodboard; a collection of colors, pretty images and other items that inspire them. You can send me whatever works for you. I start sketching with what I get and can always ask you for more specific directions. From there we can look at the options. Do you want one color or multiple? Should the armguard go halfway around your arm or full sleeve? What kind of closing mechanism would you like? Is the quiver meant for your back or hip? How long are your arrows? Which of the options is more within your budget? Don’t panic; all these options (and more!) will be looked at one by one. I will help you design the most amazing product that completely fits you and your style. In short, there are a few things you can send with your first enquiry for a custom order. what kind of product are we talking about? A quiver? An armguard? A bracelet? Is there anything specific you saw on this website that you liked? Also, you can take your own measurements for your armguard. I will need three to make the armguard fit better. Point A is where you want the armguard to begin. Don’t start to close to your wrist; you still want some movement going on. Measure the circumference of your arm at this point. Point B is where you want the armguard to end. Again, don’t put this point to close to your elbow, otherwise you’ll walk around with a very stiff arm. In general, 2cm down from the elbow or wrist will do just fine. Measure the circumference of your arm at point B. 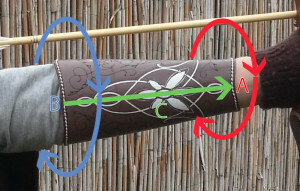 Last, measure the distance between point A and point B to get your third number, C. This will be the effective lenght of the armguard that will protect your inner arm. I will contact you a.s.a.p. to see how soon I can send you sketches and a price proposal. How long the sketch will take depends on how difficult your request is or how busy I am with making other orders. 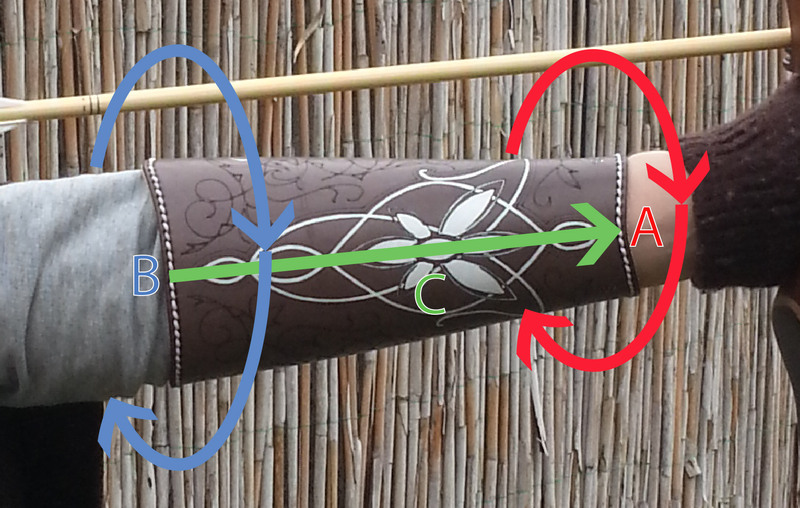 Speeking of which; the time I need to build an entire armguard or quiver can vary from 2 tot 4 weeks, depending on how much work needs to be done on the design. Some of the tiny details need to be painted over 3 to 4 times with drying time in between. Keep this in mind for orders that need to be rushed (like birthday gifts); it can be done in a shorter amount of time, but there will be a rush fee! Feel free to contact me and ask me anything you like!